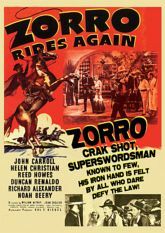 Zorro - crack shot, super swordsman, known to few - his iron hand is felt by all who dare defy the law! In this exciting 12 episode serial, the California-Yucatan Railroad is under siege by a gang of terrorists hoping to force its sale�and no one can prove their connection to profiteer Marsden. Manuel Vega, aged co-owner, calls in the aid of his nephew James, great-grandson of the original Zorro. Alas, James seems more adept at golf than derring-do; but after he arrives, Zorro rides again! Can one black-clad man on horseback defeat a gang supplied with airplanes and machine guns?